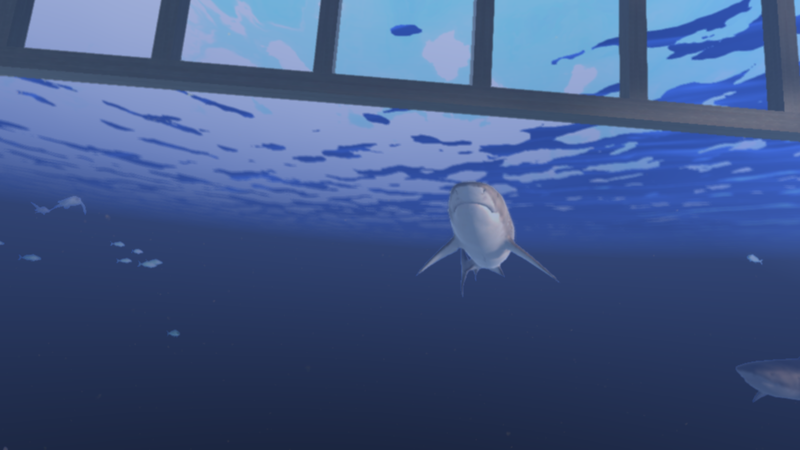 The visitor places the Vive headset on their head to find themselves beneath the waves in the confines of the shark cage. Schools of fish swirl around them as they peer into the blue. Looking up they can see the dive boat above them. In the dark depths below them they can make out the faint outline of a wreck on the ocean floor. Shadows of larger species of fish, rays, and other sea life can be seen in the distance. A bucket of bait is secured to the side of the cage on their left. Their Species Identifier Tool (SIT) is held in their right hand, following their every motion. The experience is intended to loop perpetually and feel seamless. The creatures swim out of view and swim in from beyond the drop off in visibility. Nothing pops into view in a distracting manner. At any point during the Great White’s curious passes close to the cage it may aggressively attack. With ferocity it turns towards the diver and opens its jaws, biting the cage in its attempt to reach its prey. This event can be triggered by the visitor retrieving a hunk of tuna bait from the bait pail while the shark is in the immediate area. The attack ends with the frustrated shark giving up and swimming away. Species Identifier Tool (SIT): The Species Identifier Tool is held in the diver’s right hand and tracks with its movements. An illuminated reticle floats beyond the end of the device helping the visitor orient it correctly. When the reticle passes over an identifiable species it changes to a green glow color and a prompt to activate the device appears as part of its floating HUD. Squeezing the right trigger on the Vive controller activates the device. If no species is targeted by the reticle then the visitor sees an error message appear on the floating HUD. The error message turns red to visually indicate that the attempt to has failed. Action - Error: No identifiable species detected. 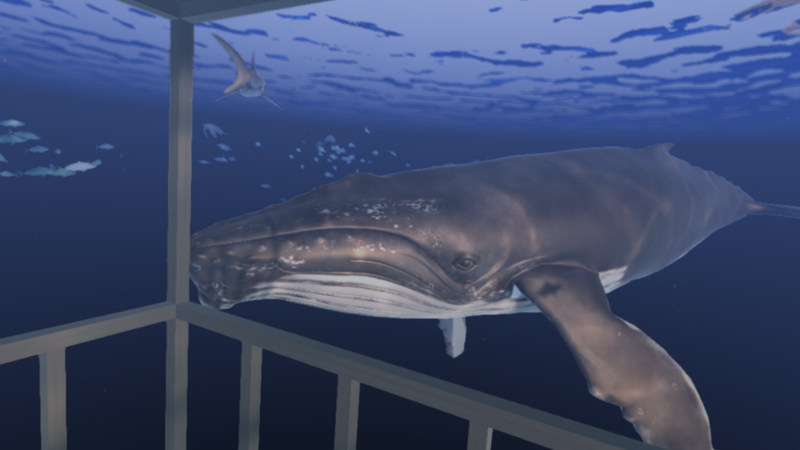 If the visitor is targeting any of the sea creatures in the environment a transparent pane appears above the device with a closeup image of the creature’s model. Basic information about the creature appears alongside the image. Upon releasing the Vive controller’s trigger, the information pane will remain active for 2 seconds before collapsing back into the Species Identifier Tool.